Boivin Starfish from the 1950s. 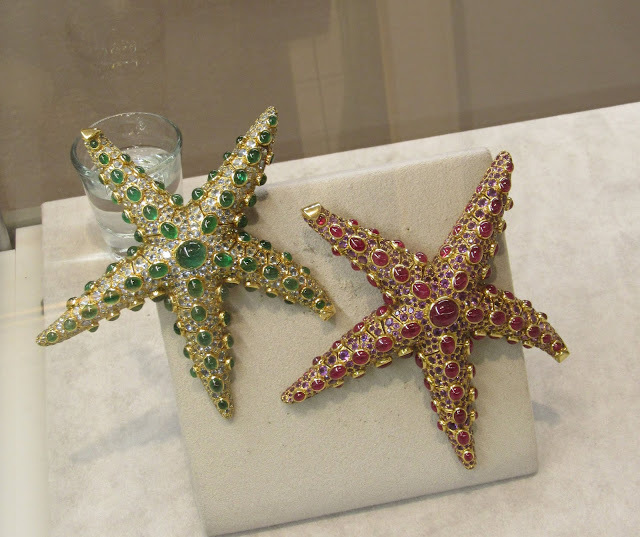 I happened to be at Christie’s for the Rockefeller auction exhibit when I unexpectedly got a chance to visit with two Boivin starfish about to go to auction in Geneva. They were stunning and huge! One was made of rubies and amethysts, the other, emeralds and aquamarines. They are fully articulated, so they move and mold themselves to the person wearing them. This particular passage in Ms. Burns’ book has me thinking about the two starfish I saw in person. According to the online catalog the starfish I saw at Christie’s were later creations, from the 1950s, so they are not the originals Ms. Burns spent her time hunting for, and, tellingly, the starfish I saw are signed, which, if you believe Ms. Burns, is not a good thing, and I would think would make them less valuable than the original starfishes, which I do believe are unsigned. They are huge and gorgeous! 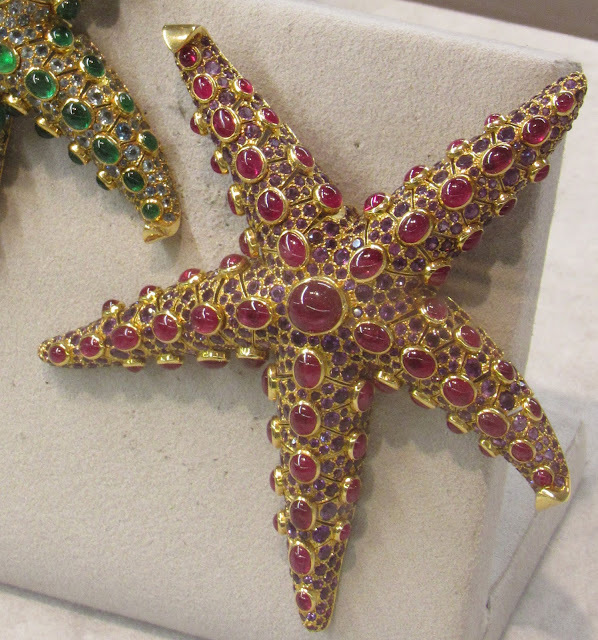 I would expect that these starfish, while stupendous, would not fetch the prices at auction than the starfish that belonged to either Claudette Colbert, the original owner of the starfish brooch, or Millicent Rogers, the Standard Oil heiress, who also owned one of the original pieces, would garner. However, both still sold for a lot of money. 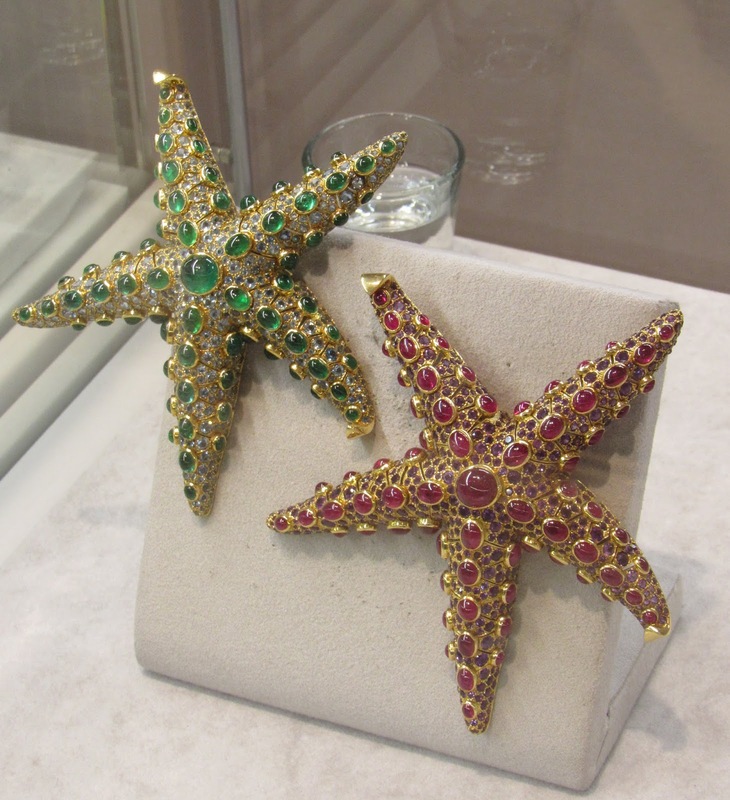 The ruby and amethyst brooch sold for CHF 125,000 (approximately $126,000) and the emerald and aquamarine sold for CHF 150,000 (approximately $151,000). A photo of the starfish once owned by Millicent Rogers. Love this photo of Millicent wearing her starfish. 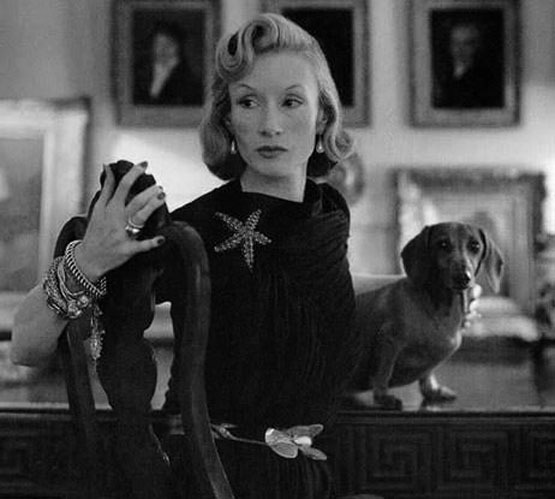 And her dachshund is adorable! A closer shot so you can see the stones and settings in detail. 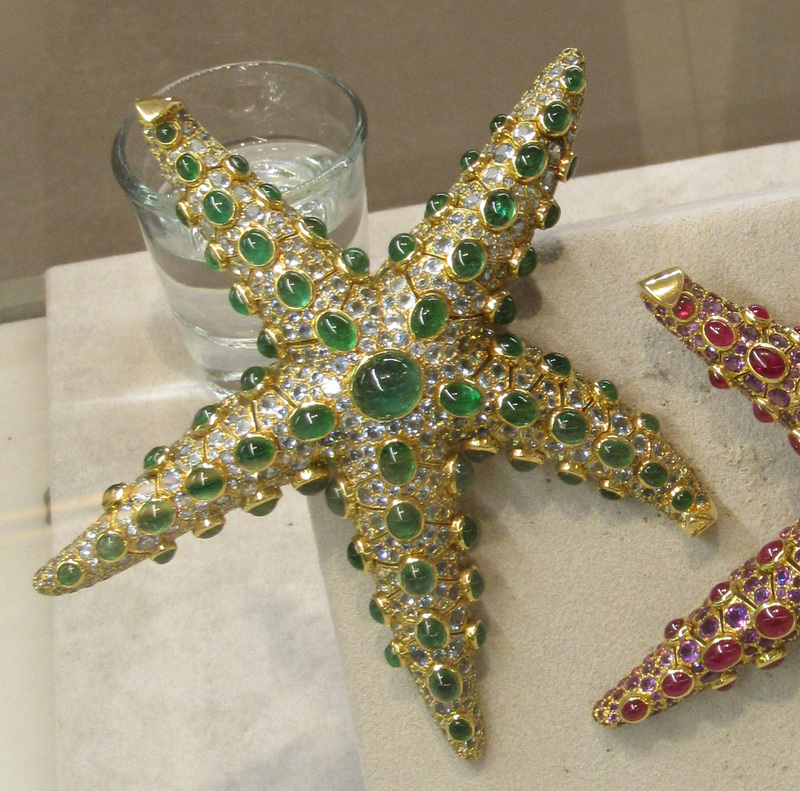 The emerald and aquamarine starfish in closer detail. Signed or unsigned, I would be thrilled to have either one of these in my collection! 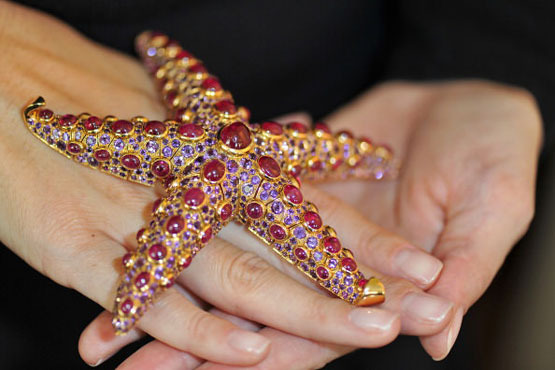 I am only partway through the book and so far Ms. Burns writes of the secretive and mysterious world of high jewelry, of trying to get information about the original starfish only to be met with silence, hostility, or shifting and shady answers. It is a fascinating read! Let me know if you are reading (or have read) the book or have ever seen one of the famous Boivin starfish. I have not read this book, yet. Will put it on my must read list. 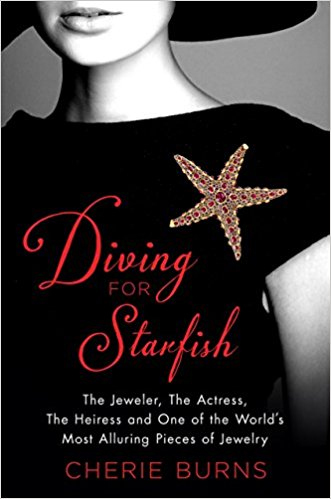 I wonder if Cherie Burns came up with the idea of the Starfish Jewelry Book while she was researching her Millicent Rogers bio. I loved Searching For Beauty and am just beginning Diving For Starfish. I have been very interested in historic jewelry and this book is very enlightening. I wonder how much one of these brooches weighs? I suppose the bodice of the dress has to be reinforced. Good post.Thank you for sharing this interesting blog.It give some useful information to me.This is easy to understand due to the simple language used here.It help me to get some new information.Thank you for giving this nice article.Visit Thesis writing service to get more topics.